Low voltage landscape lighting is one of the most impactful accent features to give that wow factor to your garden. With the newest generation of LED fixtures, there are more options than ever for lighting paths, trees, wall and steps. Our clients consistently comment that adding lights brought depth to the garden at night and the feel of the landscape inside. Our favorite lighting manufacturers are those with professional grade landscape lines- FX Luminere, Vista Lighting and SPJ Lighting. 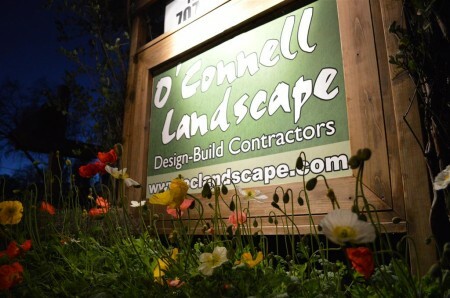 This shot from in front of our office shows our sign (lit from above) with Icelandic poppies in the foreground. As an aside we just got a new Nikon D3200 digital SLR for our office, which captured the shot above. We were early adopters of DSLRs with an old Nikon D100, and there is no comparison with the newest cameras. The image quality and quality in low light (as shown in the hand held shot above) is amazing. The auto mode on the camera is pretty impressive as well for those who want great quality, but be able to point and shoot.